ROSSBURG, Ohio (July 14, 2018) — Brad Sweet’s charge to the front was disrupted in unusual fashion on Saturday during the 35th Annual Kings Royal at Eldora Speedway. Sweet was closing in on leader Donny Schatz quickly over the final 10 laps of the feature when he came across his Kasey Kahne Racing teammate Daryn Pittman to put Pittman a lap down. Many of us expected lapping Pittman to be quick and painless. 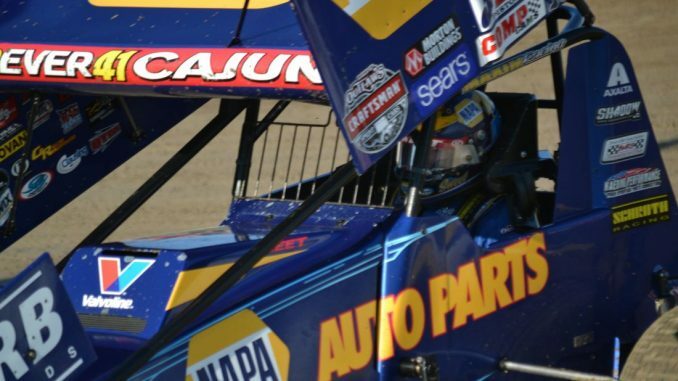 Instead Pittman ended up exchanging slide jobs with his teammate and cost him valuable time that appeared to impact his pursuit of Schatz significantly. Sweet ended up losing to Schatz by less than a second. Afterwards Sweet was frustrated but didn’t see angry with Pittman during the post-race press conference. For Sweet it was also frustrating for him to end up behind Schatz again at another one of the crown jewel events in sprint car racing. Overall Sweet seemed pleased with his performance at the Kings Royal.